Unless you make very high-end furniture such as dining tables, you probably don’t want to get into rubbing finishes. Rubbing — using sandpaper, steel wool, abrasive pads, compounds, lubricants and specialized electrical or pneumatic polishing tools — is a lot of work. And there are large possibilities for rub-throughs and other damage. But you still want your finishes to feel and look smooth. People put their hands on finishes to see how they feel. Rough-feeling finishes don’t win praise. The first coat of any finish raises the grain of the wood and locks it in place. If you don’t sand this coat smooth, the roughness will telegraph through additional coats (in most cases just one more coat) and leave the finish feeling rough. This is true for all finishes, but water-based finishes are the worst for raising grain. 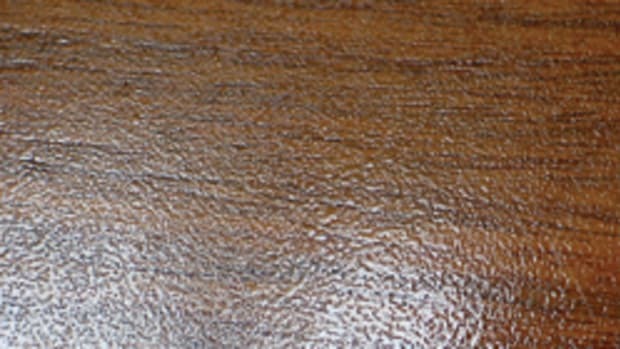 With the exception of most water-based varieties, finishes tend to gum up sandpaper when sanded. The gummed lumps cut deeper into the finish, causing scratches that can show through the next coat. Even stearated (dry-lubricated) sandpaper, which you should use, doesn’t always solve this problem. Stearated sandpaper can also gum up. To make sanding the first coat easier, many manufacturers provide a special product that can go by various names. The most common is “sanding sealer,” but there is also vinyl sealer and catalyzed sealer. Some confusion is caused by manufacturers who call their finishes “self-sealing.” All this means is that the finish is easier to sand. The first coat of any finish “seals” the wood. When sanding one of these products, you need to be careful not to sand through, especially on curves and edges. Sometimes, it’s helpful to use foam-backed abrasive pads. Using mechanized sanding tools will take some practice during which you will probably experience some sand-throughs in order to learn. All that’s necessary is to make the surface feel smooth. So choose a grit sandpaper that does this efficiently. 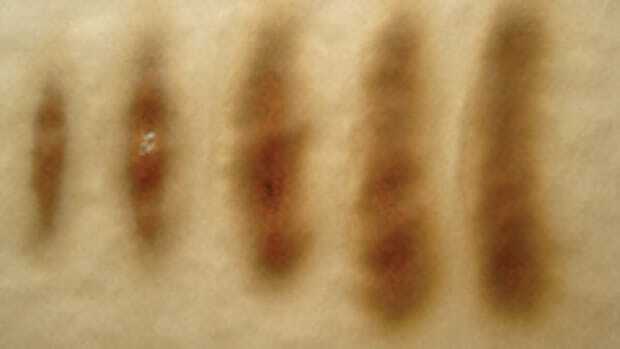 In most cases, 320- or 400-grit sandpaper accomplishes this. For water-based finishes, you might decide that 220-grit sandpaper is more effective. The goal when spraying is to get the most level surface possible — that is, no runs and no orange peel. Avoiding runs on vertical surfaces usually requires some practice getting used to the amount of spray exiting the gun and the speed with which you pass the gun over the surface. To see what is happening, always watch the surface you’re spraying in a reflected light. With no reflection, you can’t see runs developing. 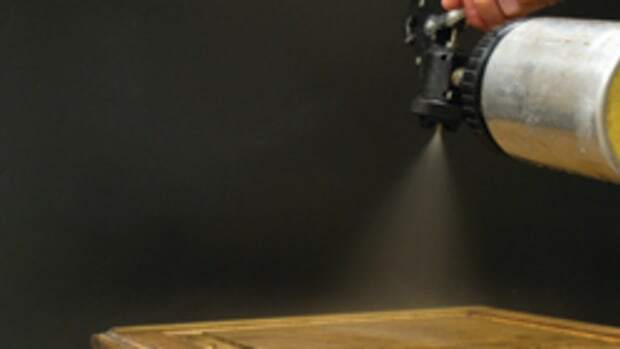 Once you have established your technique, you can usually spray surfaces successfully without a reflection. Eliminating orange peel also involves technique — how far from the surface you hold the gun and how fast you move it. Holding the gun too close or too far, or moving the gun too slow or too fast will result in orange peel. Holding too close or moving too slow causes the finish to ripple. Holding too far or moving too fast results in too little finish being deposited to flow together. You get the technique down by watching what is happening in a reflected light. Just as with avoiding runs, once you have mastered the technique, you can usually spray successfully without a reflection. But technique isn’t everything when it comes to orange peel. Air pressure and viscosity are also important. 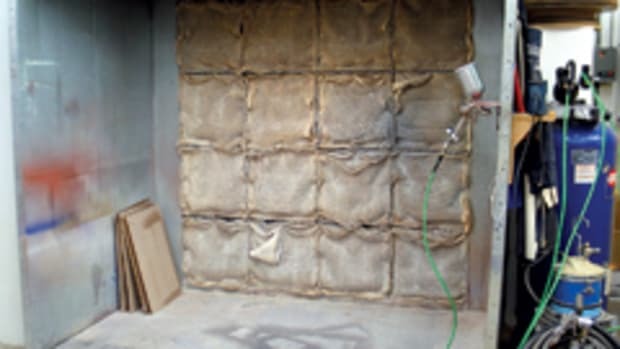 Orange peel will result if you are spraying too viscous a finish with too little air pressure. This will happen no matter how fast you move the gun or how far you hold the gun from the surface. So to eliminate orange peel, you have to increase the air pressure or thin the finish, or both. Thinning has the downside of leaving less finish deposited, which could cause you to have to apply an extra coat. The goal should be to apply as thick a coat as possible without any orange peel or runs in order to get maximum build with minimum work. To find the optimal air pressure, begin by opening all the controls on the gun to their maximum and turning the air pressure at the regulator down to well below where you think it should be — for example, to 20 or 30 psi with a compressor, or 2 to 3 psi for a turbine (if your turbine has a variable control). Then spray a short burst onto brown paper or cardboard. You’ll get a relatively narrow width pattern with noticeably large dots around the edges. Increase the air pressure by 5 or 10 psi (compressor) or 1 psi (turbine) and spray another burst. The pattern will be a little wider and the dots a little smaller. Hold the gun at the same distance from the target for each burst. Continue increasing the air pressure and spraying short bursts. Each time you increase the pressure, the pattern will get wider and the dots at the edges of the pattern will get smaller. When you reach a pressure that doesn’t widen the pattern and doesn’t make the dots smaller, you’ve gone too far. You have achieved the best atomization, but you’re now wasting material because more than necessary is bouncing off the target. So reduce the air pressure to the previous setting or to just before the pattern starts shrinking and the dots start becoming larger. If your turbine doesn’t allow you to control the psi, add thinner in small amounts until you achieve the widest pattern with minimum size dots at the edges. If you are applying more than two total coats, you might find it helpful to sand the next-to-last coat smooth before applying the last coat, whether by spray or brush. Sanding roughens the surface, which causes the next coat of finish to level better — think of water beading on glossy automobile or tabletop surfaces compared to water leveling on concrete — so orange peel and brush marks will be lessened. This trick is quite effective for removing small dust nibs without leaving scratches in the finish. It’s not effective, however, at smoothing a surface in which the sealer coat wasn’t sanded smooth. Fold a small brown paper bag from the supermarket or other store and rub it over the finish after it has dried well. Finishes harden at different rates (and temperature can affect the rate significantly), so you might have to experiment a little to find the earliest time when the finish has hardened enough so the bag doesn’t leave scratches. The bag is coarse enough to level most dust nibs, but not so coarse that it scratches fully dry finishes. Leveling these nibs is not the same as totally removing them. You could still see flaws in a reflected light, but the finish does feel better.